UFW Stories: "House Meetings at Charlie Kyle's school in Chicago, Stowe Arts Academy University Preparatory." "House Meetings at Charlie Kyle's school in Chicago, Stowe Arts Academy University Preparatory." In 1974, when I joined the boycott as a full time volunteer as Padre Carlitos, I was fortunate enough to be trained in house meetings by Fred Ross, who had trained Cesar and Dolores. My wife, Diana Eiranova-Kyle, who, with the help of Cesar and Dolores, helped free two innocent Latinos from death row and I, had the honor of being asked by Artie and Helen, to co-chair the Illinois committee for the 50th Anniversary Convention.Unfortunately, we could not be with you in body today, but we are with you in soul and spirit closely following the convention on the internet. Therefore, I want to share that thanks to my training 40 years ago, I instituted house meetings with the parents of my students, 95% of whom are Latinos. These house meetings have resulted in more parent participation not only as volunteers but as partners in their children’s education. The house meetings not only developed a closer relationship between my students and their parents, but prompted many of my parents to join ESL classes that were being held at the school at the same time their children were there. Stowe Arts Academy has received the 2008 Academic Advancement Award at the International Reading Convention and our choir sang “Si, Se Puede” at the inauguration of Illinois Governor Pat Quinn this year . Among my graduates, I have students who now are attending on a full scholarship Princeton University, University of Illinois at Urbana, University of Wisconsin at Madison and Lake Forest College. Also, a former student who is an alumni of Northeastern University is one of my current finest teachers and role models. When Dolores recruited me to the UFW in 1974, she said that I would learn more from the union than from any university. And though I hold a Ph. D. from Northwestern, taught at Loyola and DePaul Universities and lectured at Harvard and University of Arizona, I couldn’t agree more with her. 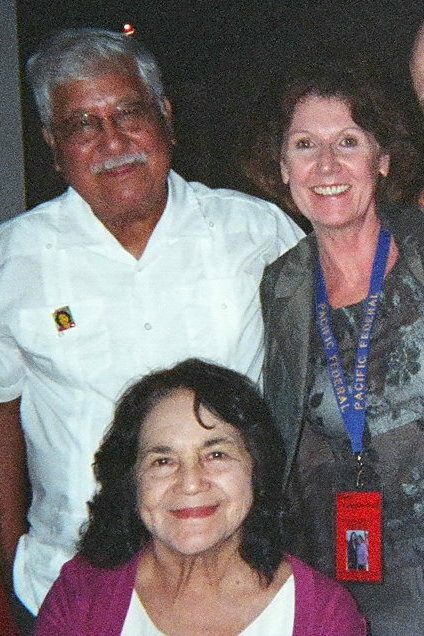 Many UFW people who have visited Stowe Arts Academy, including Dolores, her son Emilio Huerta, Paul Chavez and Julie Chavez Rodriguez, can attest to the importance of well run bilingual education programs, integration of the arts into the curriculum and successful public neighborhood schools. Today, I want to thank Cesar, Helen, Dolores, Richard, Irv and Artie for teaching me how to become a better educator. Que Viva La Causa! Que Viva La Victoria! Si, Se Puede! And… as my Argentine wife says: Hasta la Victoria, Siempre!